I have a 528 page cookbook devoted solely to cookies (and their derivatives). So, when it comes to choosing one recipe to make on busy a weeknight, the recipe has to meet a few strict criteria including having high impact (i.e., being extremely tasty and looking especially fetching) and being easy to make (no fancy equipment or ingredients needed). These Chocolate Oatmeal Crunch Bars fit the bill perfectly with their chewy, brown sugary oatmeal bottom topped with semi-sweet chocolate and a sprinkle of pecans. They taste a little like a candy bar version of a granola bar. In a medium-sized mixing bowl, stir together the oats, sugar, butter, corn syrup, vanilla, and salt. Press the mixture into the prepared pan, using lightly greased hands (or the greased bottom of a loaf pan). Bake the crust for 10 to 14 minutes, or until it’s a light golden brown. The crust will bubble up as it bakes. Remove from the oven, and cool completely on a rack. In a medium-sized saucepan set over low heat, or in a microwave, melt the chocolate chips and shortening together, stirring until smooth. Spread the chocolate mixture evenly over the cooled crust, and sprinkle on the nuts. Cover and loosely chill the bars in the refrigerator, and cut into squares. 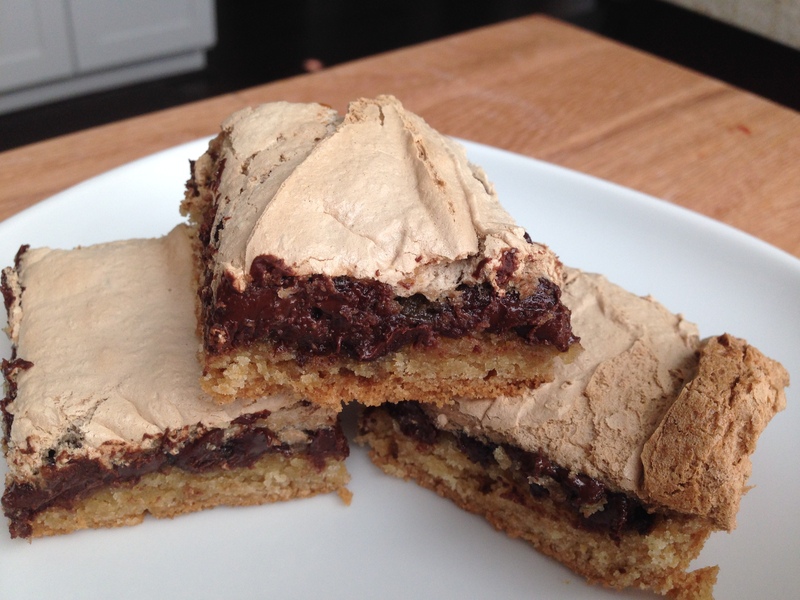 Imagine a chocolate chip cookie sitting under a rich layer of chocolate with a light, crunchy meringue topping it all off and you have Meringue Chocolate Chip Cookie Bars. It’s a multi-textured (and taste) extravaganza. It’s also a multi step prep process as you need to make a batch of cookie dough and make the meringue. So, if you’re not ready to work hard, then don’t attempt this recipe. But if you’re feeling a little ambitious, this may be just the weekend project you’re looking for. Cut 2 pieces of aluminum foil, and fold them to match the width of the pan. Press one piece into the pan lengthwise and the other into the pan crosswise with the ends hanging over the sides of the pan, like this. This makes it easy to lift the bars out of the pan once they’re cooled. Spray the foil with nonstick coating. Whisk together the flour, salt, baking soda, and baking powder in a small bowl and set aside. Using a stand mixer, a hand mixer, or by hand, cream together the butter, granulated sugar, and 1/2 cup of the brown sugar until it looks like smooth frosting. Separate the eggs, reserving the whites. Mix the egg yolks into the butter-sugar mixture one at a time until they are completely absorbed. Stir in the water and vanilla. With the mixer at a low speed, add the flour mixture and beat gently until all the flour has been absorbed and the dough looks crumbly. Press the cookie dough gently into the pan with your hands, making sure the surface is even. Sprinkle the chocolate chips on top of the cookie dough and use your palms to press them slightly into the dough. This will help keep them from moving when you add the meringue. Gradually increase your speed to medium-high. When the egg whites are very frothy and look like loose foam, start adding the remaining cup of brown sugar a little at a time. Continue increasing your speed to the highest setting. When all the sugar has been added, continue whipping the meringue until it holds a soft peak. It should look like glossy, soft-serve ice cream. Scoop the meringue down the middle of the pan. It will be very sticky! Use a spatula to gently spread the meringue from the middle to the edges. It’s helpful to skim meringue from the top and gradually push it outward. Lightly press a piece of parchment or wax paper on the top of the meringue (this makes an even layer and protects the meringue from scorching). Bake for 20 minutes, then remove the parchment. Continue baking for an additional 5 to 10 minutes, until the edges look toasted and are pulling away from the sides of the pan. Wait until the pan is completely cool before lifting out the bars and cutting them into pieces. This Flourless Chocolate Cake is the overlord of all chocolate cakes. With a chocolate trifecta of chocolate chips, cocoa powder, and espresso powder in the cake plus a hearty slathering of chocolate ganache on top, this is the richest, most decadent chocolate cake you will ever eat. There’s no flour in this cake to take up any space from the chocolate, so gluten-free people rejoice! Lightly grease an 8″ round cake pan; cut a piece of parchment or waxed paper to fit, grease it, and lay it in the bottom of the pan. Put the chocolate and butter in a microwave-safe bowl, and heat until the butter is melted and the chips are soft. Stir until the chips melt, reheating briefly if necessary. You can also do this over a burner set at very low heat. Transfer the melted chocolate/butter to a mixing bowl. 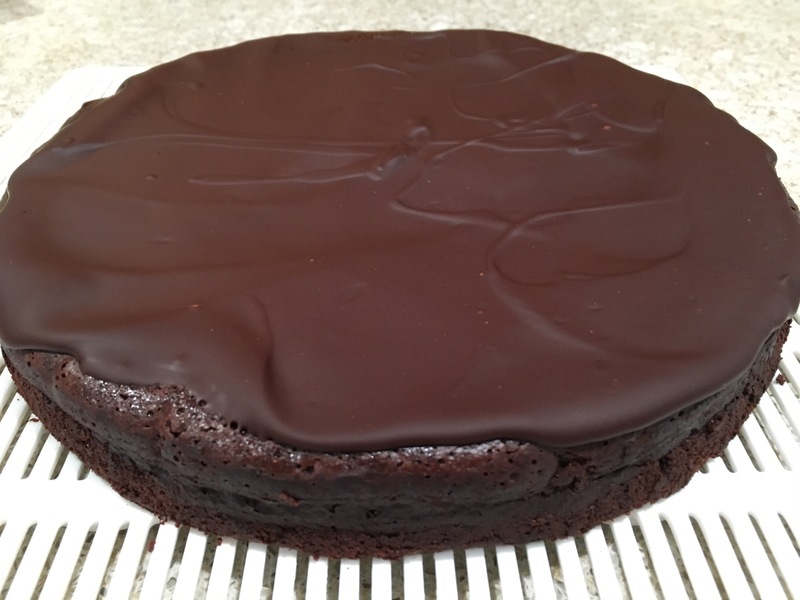 Bake the cake for 25 minutes; the top will have formed a thin crust, and it should register at least 200°F on an instant-read thermometer inserted into its center. Note: The original recipe recommends inserting a thermometer, but I didn’t do that. Remove it from the oven, and cool it in the pan for 5 minutes. Combine the chocolate and cream in a microwave-safe bowl, and heat until the cream is very hot, but not simmering. Remove from the microwave, and stir until the chocolate melts and the mixture is completely smooth. Or you can melt the chocolate and cream over a double boiler.